Only from Le Creuset cookware - a functional whistling kettle that is fit for any kitchen. This is a traditional whistling kettle that is suitable for all heat sources including induction stoves. It has a 2.1 litre/3.7 pint capacity and is ready in minutes. Le Creuset is known for their excellent cast-iron cookware that comes in a range of merry colours. 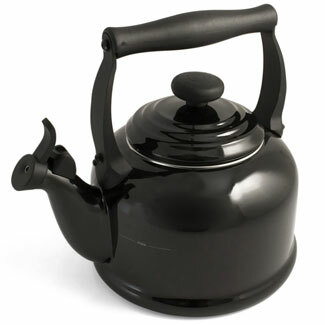 The same quality kettles have been developed with these unique designs features in mind. Both your kitchen and dining room table will benefit from this brilliant piece of kitchen cookware. Some tips on how to use the kettle: Ensure that you never heat up the kettle if it is empty and never fill it up beyond the level mark. The ring or burner must be the same size as the base of the kettle, match this to ensure even boiling. If the kettle is left for a long time in a boiling state, the enamel will wear down - this will cause your kettle to lose its delightful appearance. Do not leave water to stand in the kettle, this will build scale. This Le Creuset kettle is well worth the purchase, order one today and choose from a wide variety of colours.